My daughter is not a pretty-princess girly-girl. She's never played with dolls or barbies. She loves her stuffed animals, though. 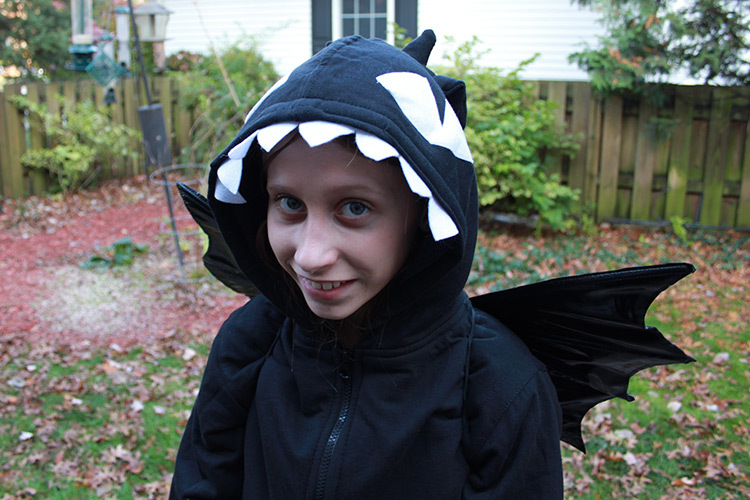 For Halloween, she wanted to be "Toothless" from the movie and TV show How to Train Your Dragon. He's the cute, black dragon. 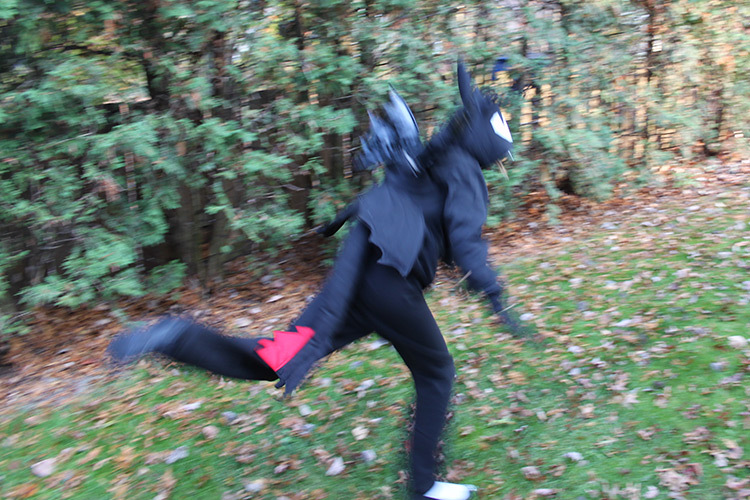 Of course, no store had a Toothless costume. I found some pinterest inspiration here, here and here. Since I haven't been able to draw lately, I was looking forward to using some creative muscle with my sewing machine. I'm not the most experienced sewer but I can do basic stuff. I bought a black hoodie, some white felt and three pairs of black jogging pants - one to wear and the other two for material. We had black gloves from the year she was a black cat. I also found "bat wings" online for cheap and figured we could use those for her dragon wings. I made the eyes and teeth out of the white felt and sewed those on the hood. I cut out and stuffed those ear/horn things and sewed those on the hood, too. 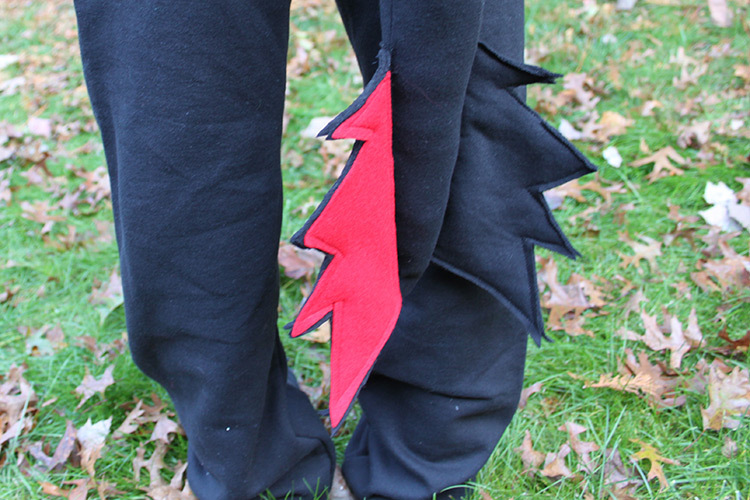 For the tail I just sewed one of the pant legs on an angle (so it was pointy) and stuffed it so it wouldn't be too floppy. 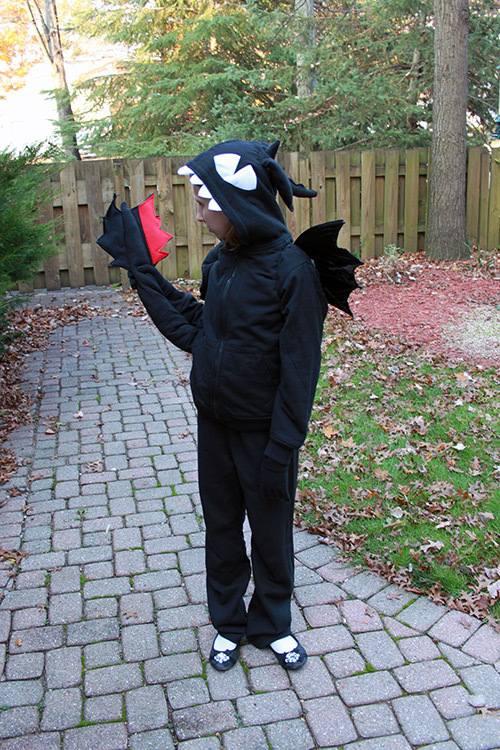 To make the "fins" on the top and bottom of the tail, I looked up pictures of Toothless and just cut out the basic shapes of those from the leftover jogging pants material. I think it all came together pretty well! My boys were easy this year. Aiden wanted to be a Skylander. I found a $15 costume at target and Eli could wear his lobster costume from last year! Yay! Who knows if we'll get to go trick-or-treating this year. It's raining like crazy today! What are you doing for Halloween?